Our Apartments in West Phoenix are characterized by well-thought-out floor plans, and Santa Fe is one such floor plan perfect for contemporary, resort style living. Covering 838 square feet, Santa Fe features two spacious bedrooms, one shared bathroom and a modern kitchen. When designing Santa Fe, the architects had in mind two roommates looking for an affordable apartment to provide luxury, comfort and enough room without one person necessarily invading the other’s personal space. This, however, does not limit the Santa Fe apartment floor plan to roommates. 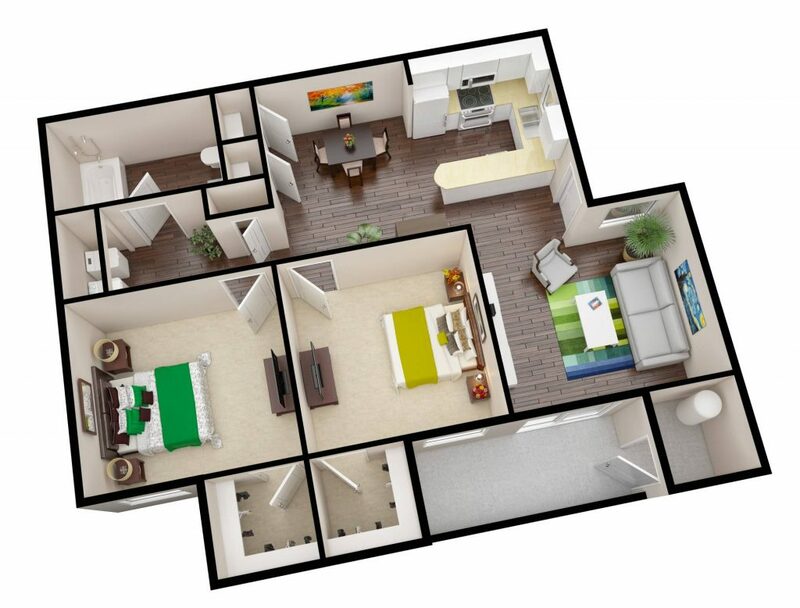 If you are a young family or an individual expecting guests, this apartment layout can work just as well for you. This contemporary apartment also has an extra hallway closet for extra storage. For those who love natural sunlight and fresh air, there is a patio that offers spectacular views of the surrounding area. The patio also features a storage closet where you can keep anything that you don’t want in your apartment. If you are looking for an affordable apartment in West Phoenix, The Cove Apartments – and the Santa Fe floor plan specifically – are worth considering. Enjoy life in this serene community with world-class amenities like a fitness center, a spa, a swimming pool, and lush leafy landscapes.